Medo, one of the abused elephants at Elephant Nature Park, rests against a log. Despite her very apparent injuries from past abuses, she is able to live day-to-day at the park. 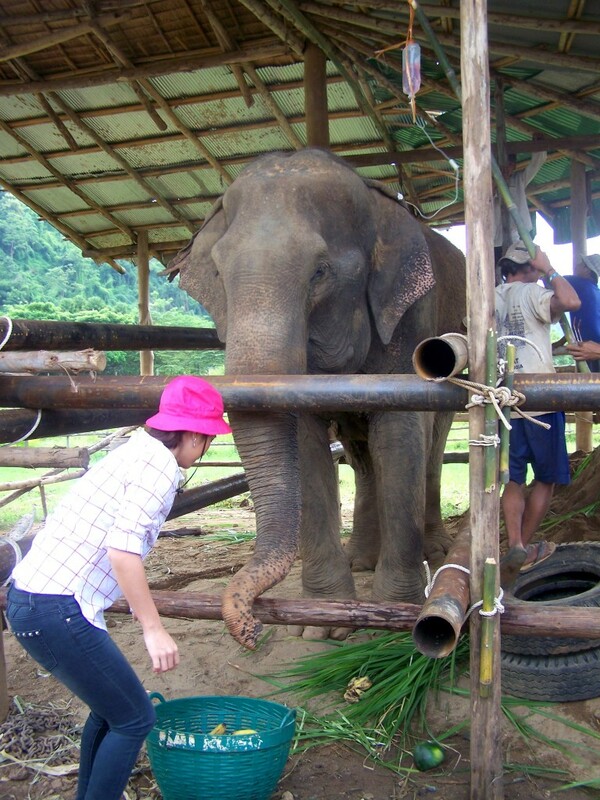 To say there are a lot of tears on the last day as volunteers at Elephant Nature Park is an understatement. At least as it relates to me. 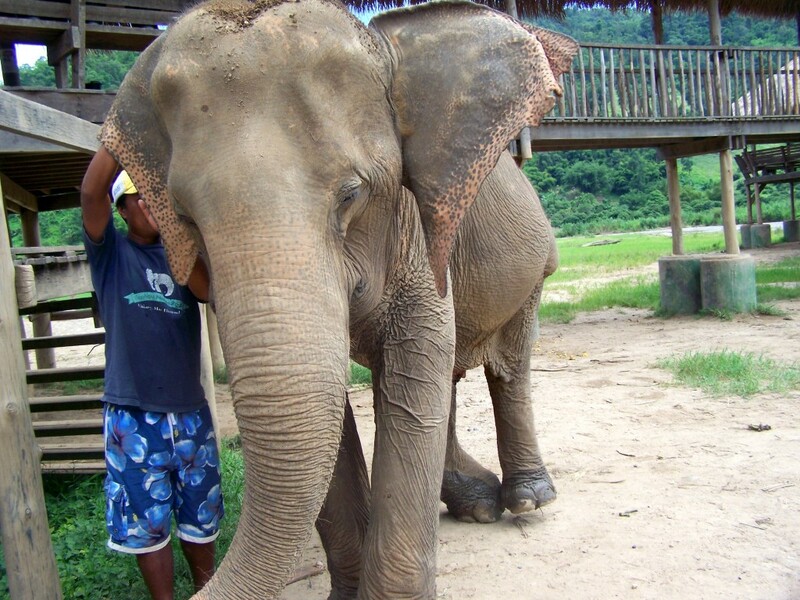 If there’s one thing I have noticed during my week as a volunteer at Elephant Nature Park is that I cry. A lot. More than most people. Maybe it’s because my emotions are hard-wired to my tear ducts. 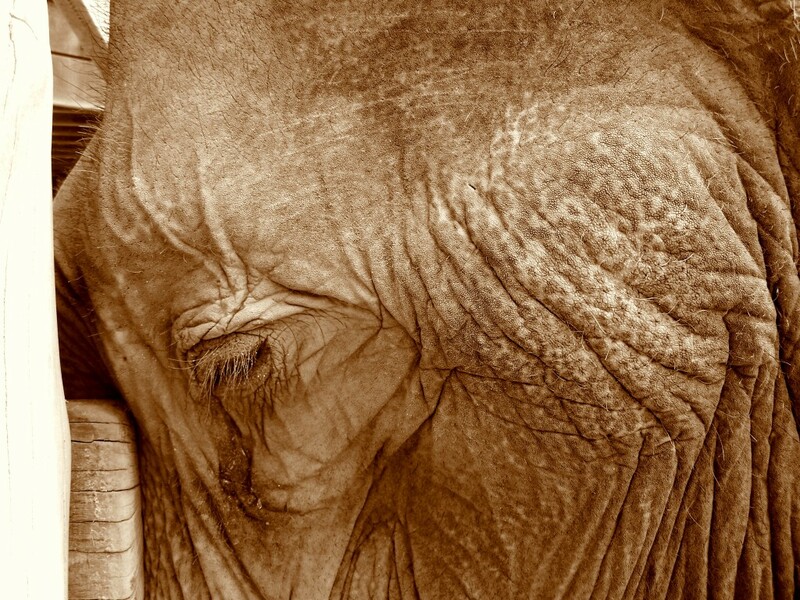 And, combined with my love for animals and my admiration for these elephants, along with learning all of the awful things they are subject to in their pre-ENP lives, those tears just flow, flow, flow. After seeing Mae Sai Roong stand following a day of heartbreak? Tears. Tears. And, more tears. Dumping the last buckets of water over elephants in the river? More salty goodness down the face. Saying “goodbye” to the first group of volunteers as they are ushered into the van and taken back to Chiang Mai? Yup. Stupid tears. Of course, when Lucy and I decide to go spend the last remaining bits of time with “our” elephants on the gorgeous Sunday afternoon, it’s pretty much a recipe for watering of the eyes. 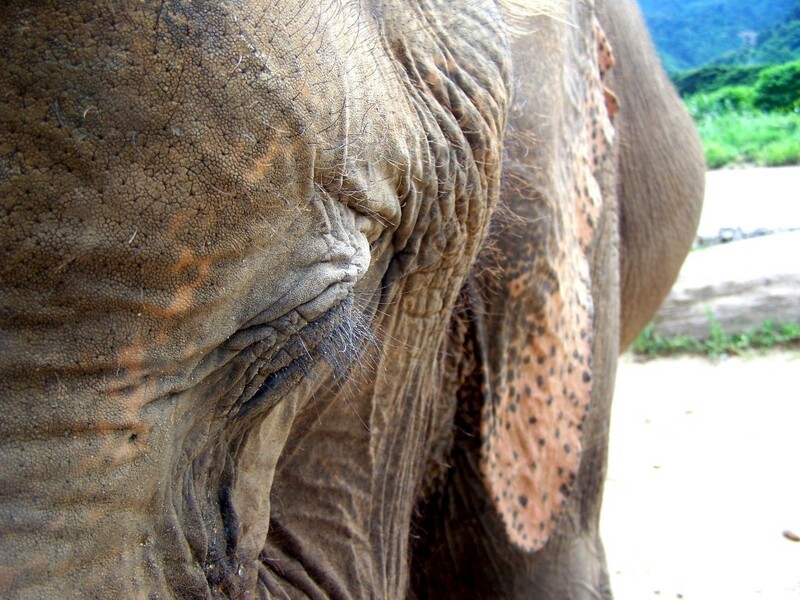 We have our plan: first, we’ll find Medo’s mahout and see if we can go down and see her, then it’s back to the front of the park to see Mae Sai Roong. After we’ve dumped the last bucked of water over the gigantic elephant heads, she and I head to the deck where some of the mahouts are sitting, their elephants below them. Medo’s mahout sits on a bench above her, watching her as she idly chomps on fruit. “Can we see her?” I ask him, gesturing down to the elephant, who is easily recognizable by injuries that have left a lasting mark on her body. 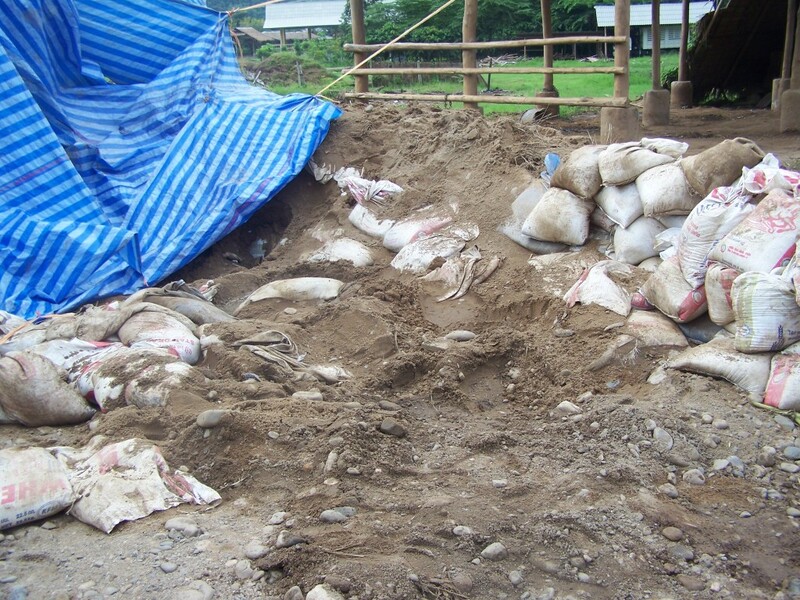 I had a good look at the remnants of abuse on her body earlier in the week when I got up-close with the elephants. He nods, stands up and walks with us down the wooden stairs to the creature. I’ve loved Medo since the moment I saw her and heard her story. She and I walk towards each other, her flapping her ears, me with a huge smile on my face. I like to think both of us are smiling at our time together. 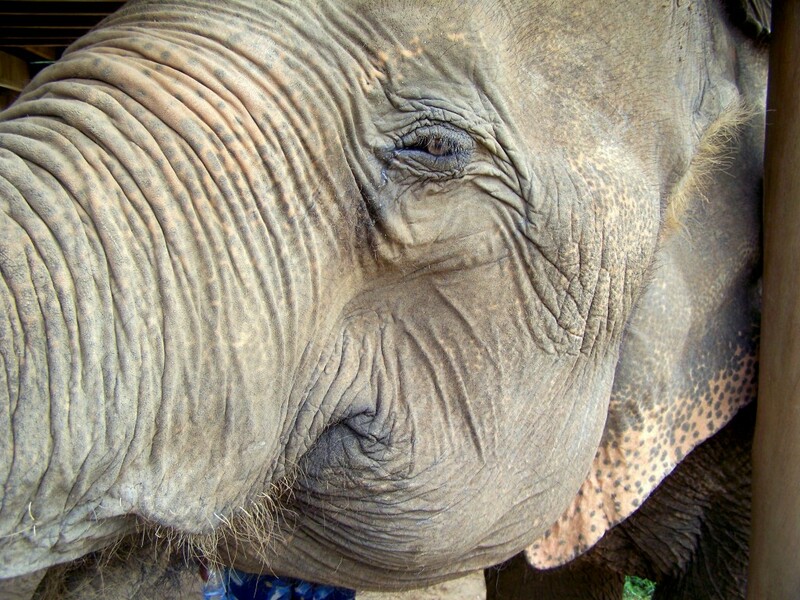 I look to her mahout, arm raised, about to reach up to her giant leathery gray and pink speckled face. “Can I? I place my hand on her face, behind her eye, and scratch. Tears well up in mine. I’m truly moved by this beautiful animal … her pain and struggles over as she lives the rest of her life here, at a place that within a week has touched me so deeply. I whisper softly to her, telling her how lucky she is, that I love her. She presses the front of her face into a post and leans in, towards my hand as I scratch more. I stand with her, filled to the brim with admiration and gratitude, for about 10 minutes. When it’s time to leave, I gently pat her cheek and promise to see her again one day. Then, it’s off to Mae Sai Roong for Lucy. The makeshift bed for Mae Sai Roong is abandoned after a long 24 hours. 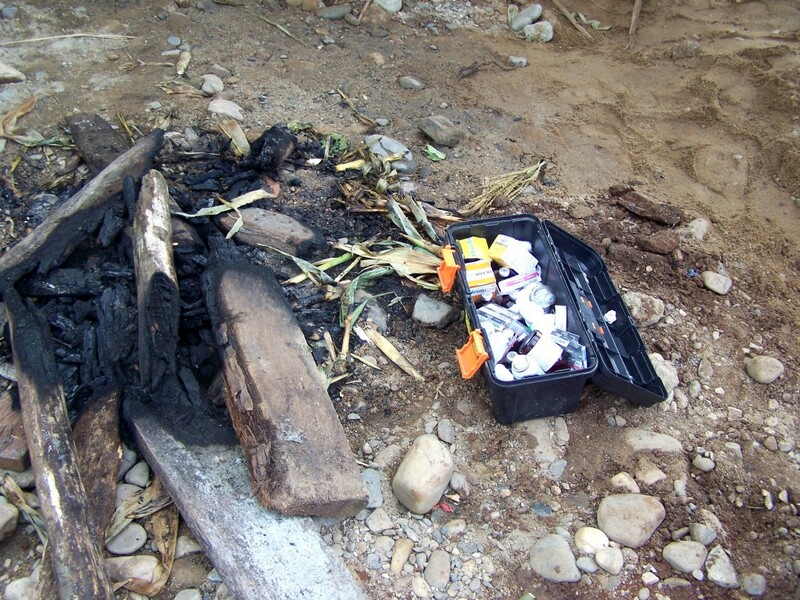 Only remnants from a fire and medical supplies remain from the previous emergency. When we get there, both of us freeze. Mae Sai Roong stands up after nearly passing away the day before. 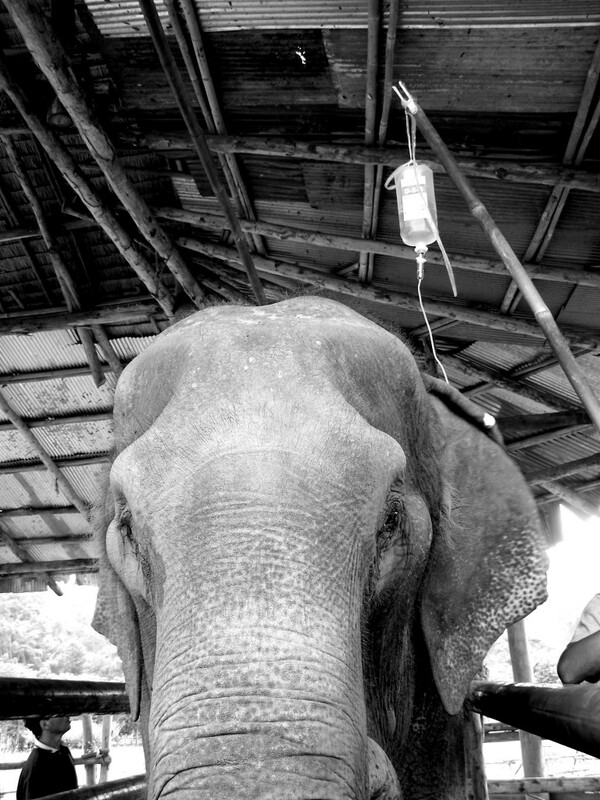 Hooked up to an IV, and with an appetite, Mae Sai Roong has come along way. She’s standing. Flapping her ears. Chomping on fruit. Tears of happy bubble up in my eyes. 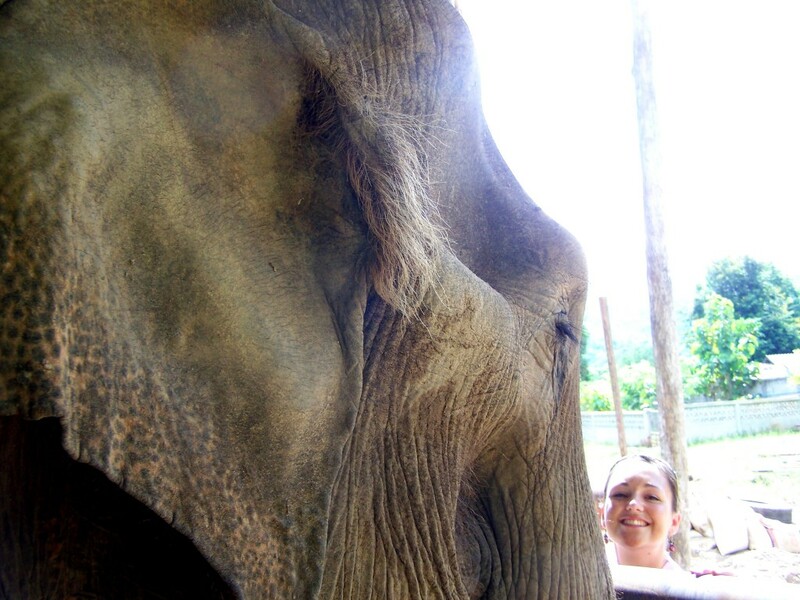 Lucy smiles as she visits with the recovering elephant. We reach our hands into a bucket and produce pieces of melon for her to eat. The elephant, who could barely muster the strength to swallow bananas the day before, sticks her trunk out through the fence and wraps it around our offerings, then shoves the fruit into her mouth. We smile to each other. Time to leave the world of elephants. I’m not even sure how to say a proper goodbye. Lek is at the main compound when we begin to gather our things. Instead, I hug her tightly, promise her I will share my stories. As we drive down the dirt road, I wipe the tears from my eyes. I have a new mission as we head back to Chiang Mai: to do whatever I can to help save more of these elephants and to educate others about Elephant Nature Park, the dark side of the elephant tourism industry, and what we all can do to give back and make a change in their lives. But first, I have five more days in Thailand and some exploring of Chiang Mai to do. Reading this comment makes me SO happy!!! I am so glad you got to spend time with them, it makes my heart warm!! My biggest fear about going to a place like this is that I could NEVER leave the world of elephants. I don’t blame you at all!! Look at me … I cannot wait to go back and stay with them longer!! Haha! My friend made me take it with me to send to Glamour! I love it!!! Good thing that I just arrived in Thailand and still have more than 6 months left to go and visit your Elephants!!!! Enjoy!! Definitely go up there! Let me know when you go! Me too … 🙂 When you thinking? Heartbreaking and inspiring! I wish there were more rescue organizations and habitats for these amazing creatures. What a stunning experience this must have been. Such beautiful animals. I’ll have to check this place out when I tour SE Asia next year. You definitely should! There’s a chance our paths may cross if you’re there, so let me know! Beautiful post, as always. 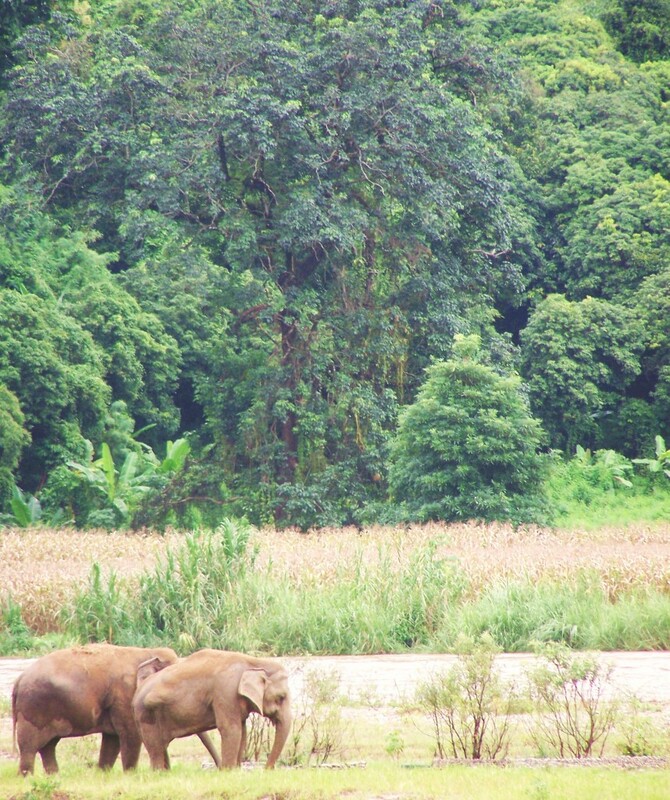 You have single-handedly put Thailand and Elephant Nature Park on my list of must-see places. Thank you. I’m so glad I put Thailand and ENP on your list of must-see places. It truly is!!! thats pretty cool that you get to interact with the animals, keep having fun! Awww, thanks. I love that photo. I was SO happy in that moment. I’m looking for things fior my daughter to do over the summer in Thailand, Singapore and Malaysia and found your post. Thank you for sharing your experience. She was in Uganda last summer (building a school classroom and teaching), and will have a 4 month break this year after finishing her A levels and before university. She wants to travel and do some volunteering during the break, and this sounds ideal. Your daughter sounds very fortunate to have had those experiences!! This one is a great one and I highly recommend doing it! If you have questions, let me know. I love all the things you’ve learned and experienced here. Its really nice that you are able to share it with us all for our own personal inspiration. 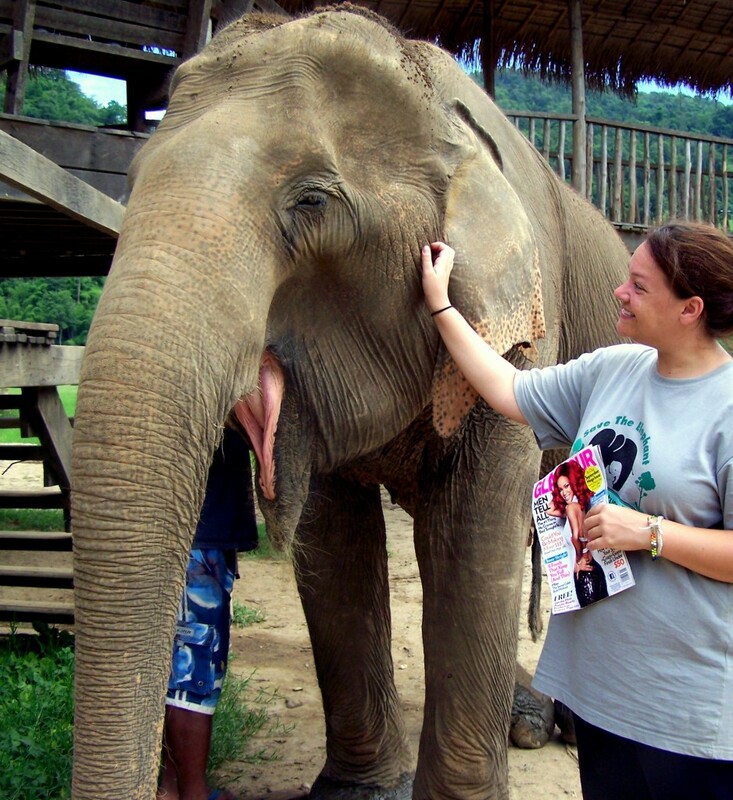 For me, for example, I never would’ve thought to go an elephant nature park, but now I think I could learn and do some good there, too on my next trip to Thailand.